Imagine you’ve just watched an interview with a charismatic celebrity on a late-night talk show. He told a funny personal story, and now you’re excited about seeing the new film he’s starring in that premieres next week. Wouldn’t it be powerful if your content could spark the same type of connection with your audience members? The intimate nature of audio content helps you entertain, educate, and inspire your audience in ways that make them naturally want to find out more about your business. To discover even more about developing, launching, and running your own remarkable show, check out our proven, step-by-step podcasting course. Kelton Reid shares the simplest and most effective ways to produce a podcast from scratch in our sleek How a Podcast Is Born infographic. Podcast production involves many different tasks, but Kelton walks you through each step — from defining your goal and audience to promoting your show. Structure is just as important to compelling audio as it is to an article or other written content. The quickest way to lose a listener is to fail to achieve a coherent flow of the points you’re trying to make. After Brian guides you through ways to structure your audio content, he then demonstrates how to become a persuasive storyteller and present your material in an enticing way that captivates listeners. Both new and experienced podcasters can make unintentional mistakes that hinder the growth and potential of their smart podcasts. Jon Nastor has created his own successful podcasts and helped countless others do the same. He reveals what it takes for your show to get the attention it deserves in 5 Surprising Reasons Why Good Podcasts Fail to Get Noticed. Use this post (and save it for future reference!) 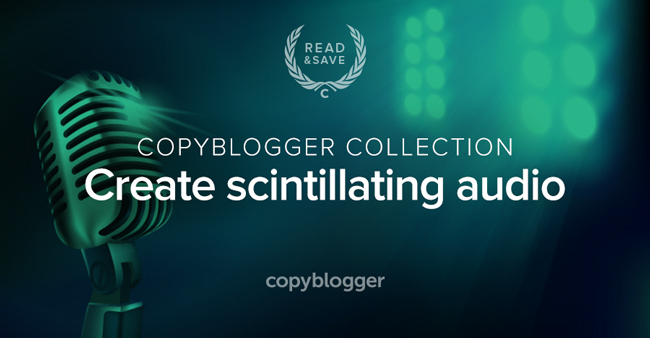 to help you incorporate audio into your content marketing strategy. We’ll see you back here on Monday with a fresh article to kick off the week!